Genius hour is a movement that allows students to explore their own passions and encourages creativity in the classroom. It provides students a choice in what they learn during a set period of time during school. 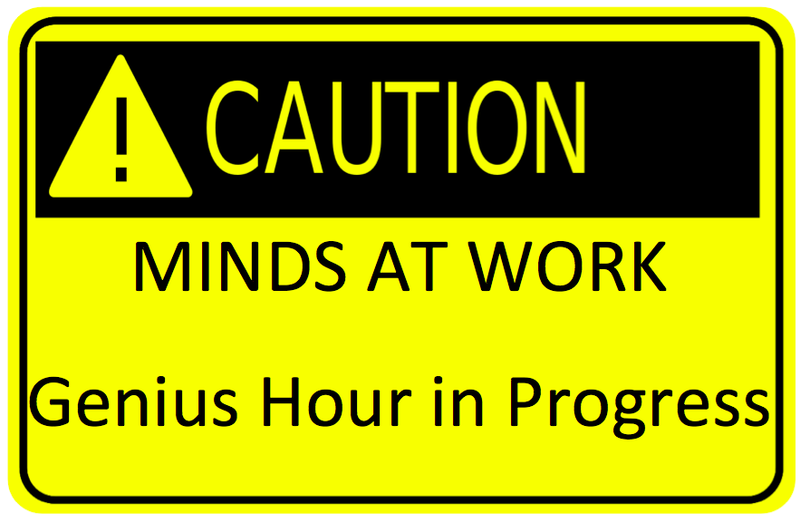 It’s not easy to determine where the idea was originally created, but there are at least two events that have impacted genius hour. The search-engine giant, Google, allows it’s engineers to spend 20% of their time to work on any pet project that they want. The idea is very simple. Allow people to work on something that interests them, and productivity will go up. Google’s policy has worked so well that it has been said that 50% of Google’s projects have been created during this creative time period. Ever heard of Gmail or Google News? These projects are creations by passionate developers that blossomed from their their 20-time projects. Another origin of genius hour projects came from the book Drive by best-selling author, Daniel Pink. In a blog post he writes about how the Google-time projects are also used in other corporations. 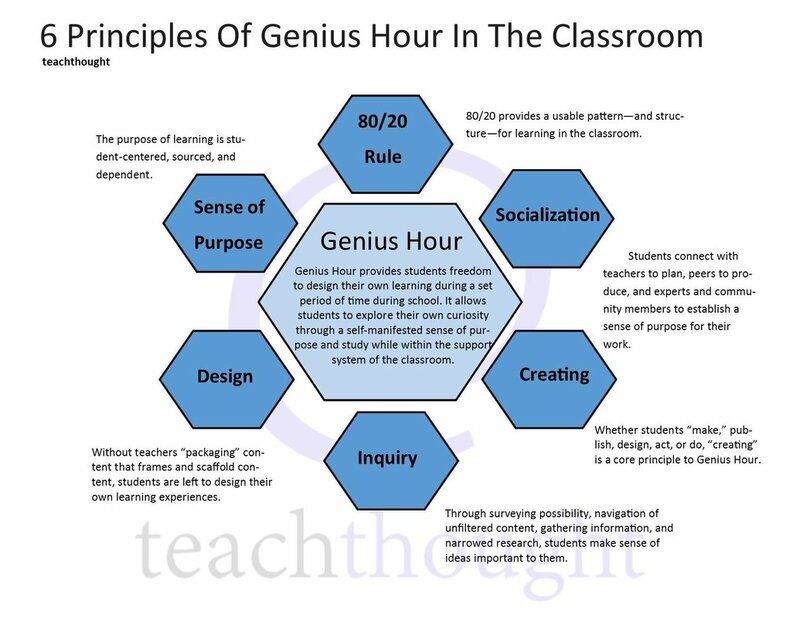 The same genius hour principles apply in the classroom as they do in the corporate environment. The teacher provides a set amount of time for the students to work on their passion projects. Students are then challenged to explore something to do a project over that they want to learn about. They spend several weeks researching the topic before they start creating a product that will be shared with the class/school/world. Deadlines are limited and creativity is encouraged. Throughout the process the teacher facilitates the student projects to ensure that they are on task. There are many educators leading the way with passion projects in their classes, but much of their inspiration came from the book The Passion-Driven Classroom: A Framework for Teaching & Learning by Angela Maiers and Amy Sandoval. A.J. Juliani also wrote a recent book about Genius Hour and 20% Time in education. Many teachers are raving about the autonomy that students are finding in their classes, including myself. I have been leading a group of 6th graders through the genius hour process this year and it has been very rewarding to watch them learn. A goal of every teach should be to create lifelong learners. Genius hour projects are a huge step towards that goal. Can we work with partners? No, not on this first project. Once we get one under our belt I will definitely consider it. How long do we have to work on this? There is no official timeline, but I’m thinking 8-10 weeks should be sufficient to have a great project. When you say anything, do you really mean anything? Anything within reason, but I will be approving your topic ideas before you are allowed to get started. Do I have to present it to the front of the class? You have to present it in some form or fashion. If you make a documentary, then you will show the movie. If you make a model, you will need to present what you learned to the class. This is about sharing passions and ideas.